Help your customers to find you! 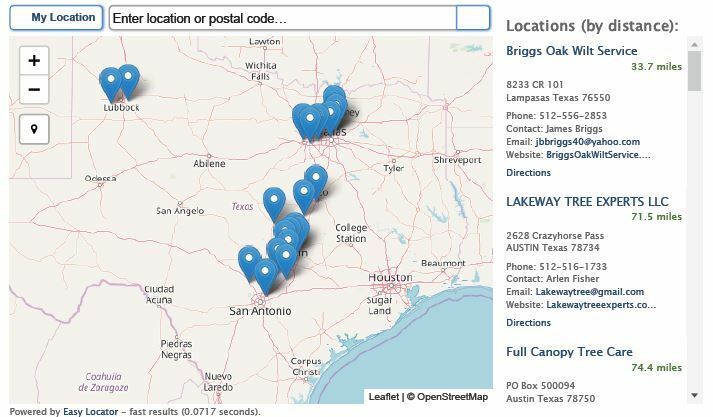 Register today to be listed as a 2019 vendor in the Oak Wilt Vendor Directory on the TexasOakWilt.org and ISATexas.com websites. You must have a staff member who is an ISA and ISA Texas member in good standing and have an current Applicator’s License to be listed. Your listing will not be published until it has been reviewed for membership and licensing. Note: Starting in 2016, the new Texas Oak Wilt Qualification replaced the Texas Oak Wilt Certification. If you plan to retain your oak wilt credentials, you must take the new Texas Oak Wilt Qualification course and assessment. These Qualifications will be valid for five (5) years. There will be two chances to take the Oak Wilt Qualification Course and Assessment this year: Tentative dates for are May 23-24 in the Fredericksburg and June 20-21 in Weatherford. Check the events listing on www.ISATexas.com for updated information.